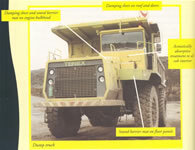 The cabs were situated immediately beside the engine compartments and separated from them by plain sheet steel bulkheads. 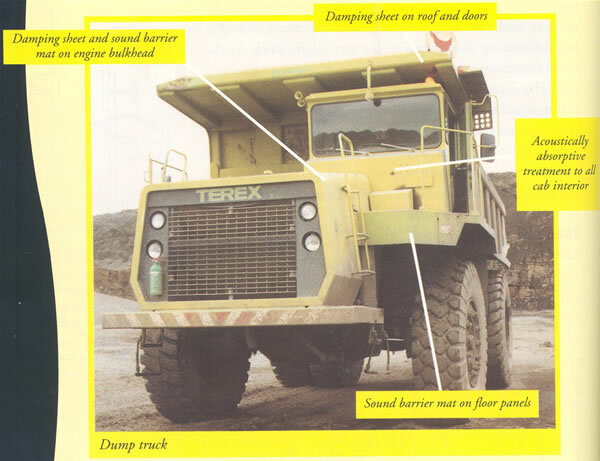 The vehicle construction itself was one of an all-welded, undamped steel plate that resulted in noise and mechanical vibration emissions from the engine and gearbox. A three-fold approach to noise reduction was taken: the large surface areas of the cab, roof, bulkhead and door panels were treated by the application of 10 mm thick bitumastic damping pads to reduce resonant vibration; a proprietary sound barrier mat consisting of a lead/fibreglass laminate was applied to the floor and engine bulkhead; an acoustically absorptive foam was applied to all available surfaces inside the cab to reduce reverberant sound build-up. A noise reduction of up to 11 dB. Information supplied by EMD Services.